In December we reported that Mueller’s Special Counsel team scrubbed Peter Strzok’s phone and then turned it over to the Office of Inspector General investigators after Peter Strzok was fired from the special counsel. Peter Strzok was fired from the Special Counsel after text messages surfaced showing that he had a strong hatred for Donald Trump and his supporters. His lover Lisa Page reportedly resigned from the Special Counsel in May 2017 – two weeks before Strzok was fired. Lisa Page’s phone was scrubbed and not turned over to OIG until September 2018. Strzok’s anti-Trump lover Lisa Page’s phone was also scrubbed clean. But this was their work phones. What about their private phones? Did Strzok and Page use their personal devices to share work related emails. Another question is how would Strzok’s attorney know what was on the corrupt FBI agent’s personal phone? Did he review the phone himself and if so, when? How would Strzok's attorney know if the deleted email messages, deleted sometime prior to August 2017, were "unrelated" to any of the investigations unless Strzok's attorney had seen and read the emails? If Strzok's attorney read the emals when did the attorney first read them? But this really doesn’t matter because there is no way that these two corrupt former FBI employees didn’t use their personal phones to communicate. 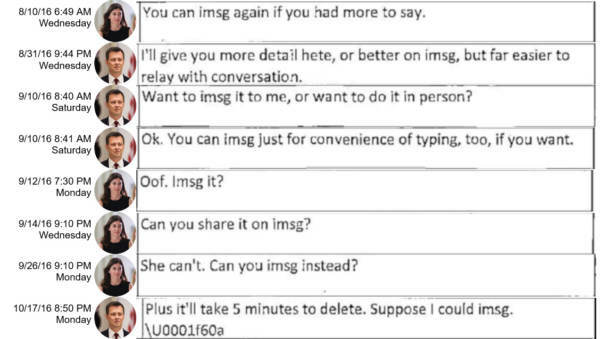 It is easy to prove Strzok/Page used their own personal devices for messaging…because of iMsg from Apple. For one, there’s no way the government would allow that application on their government issued devices. Strzok/Page were issued Androids, and they weren’t technically efficient enough to figure out how to put that on their government-issued devices, even if the government would have allowed them to do so….. The corrupt FBI lovers must have used their personal iPhones to communicate with each other about their coup. Rudy Giuliani told reporters Buck Sexton and John Solomon that Robert Mueller should be investigated for the destruction of this evidence. Rudy is right. Mueller is one of the most corrupt players in Washington DC today. Also, Strzok and Page’s iPhones should be obtained to determine what messages they shared on their personal devices! President Trump lashed out a dirty cop Robert Mueller on Twitter in December for scrubbing clean Strzok and Page phones before incriminating evidence was found by honest investigators. The Mueller Angry Democrats recently deleted approximately 19,000 Text messages between FBI Agent Lisa Page and her lover, Agent Peter S. These Texts were asked for and INVALUABLE to the truth of the Witch Hunt Hoax. This is a total Obstruction of Justice. All Texts Demanded! The President is right. The Mueller investigation is a sham. The American people know it. Mueller, Strzok and Page are just Deep State pawns. The post REVEALED: Dirty Cop Mueller’s Corrupt Strzok and Page Clearly Shared FBI Related Messages on their iPhones – Lied About It appeared first on The Gateway Pundit.